To celebrate International Women’s Day 2019, I would like to share a fascinating serial which is held in our local studies collection. 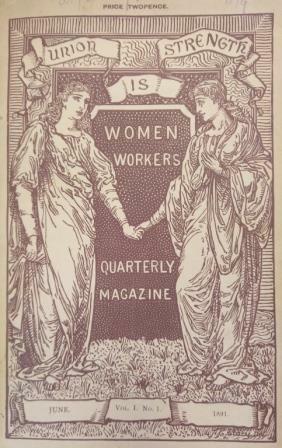 Women Workers (L 41.2) was the magazine of the Birmingham branch of the National Union of Women Workers. The NUWW was predominantly made up of middle-class women who were involved in charitable work and social and political reforms. The Birmingham branch formed in 1887 to promote “the advancement of the welfare, spiritual, moral and physical, of the women and children of our city” and published a quarterly magazine from 1891. Its aim was to support and share information about the many societies in Birmingham run by women as well as promote the work of the union itself. At this time the city was a hive of philanthropic activity with 48 different affiliated organisations listed in the first issue working in areas such as education, temperance, poverty and health. All of which were chaired by women, many from prominent industrial families. Electricity and the portable kitchen…. James Watt had already made friends with a number of men with enquiring minds when working in Glasgow, some years before he came to Birmingham and met up with the ingenious ideas of the Lunar Society. Dr James Lind (1736-1812), physician (MD Edinburgh 1768) was one of those early Scottish friends and there are a number of letters between them. These illustrate Lind’s inventiveness, technical expertise at devising equipment, and his bonhomie. He made a voyage to Iceland with Sir Joseph Banks in 1772, was created a Fellow of the Royal Society in 1777 and settled at Windsor when appointed physician in the royal household. He had his own private printing press. He knew Shelley at Eton and appears as ‘the old hermit’ in Shelley’s ‘Laon and Cynthia’. This letter to Watt is dated on the docket 1765, when Watt had established, with John Craig, a shop in Glasgow selling mathematical and musical instruments. Lind had brought a ‘perspective machine’ from India in the early 1760s, but it was made from brass which rendered it too heavy to be useful for surveying work. Watt developed a lighter model which would fold up into a walking stick, and a box, which could be put in a greatcoat pocket. He also developed a means of batch production. The machines were being sold by late 1764.